whose patience is to write to help other people for overcoming from any problems or to lit the light of knowledge to all the people. Such incredible people who serve others by writing amazing content are rewarded by InfoBarrel. Thus writers can generate a good income from it and have huge passive income through advertising channels. Let me also focus that the goal of InfoBarrel is not only to help in generating passive income but it also want be an information destination and the serve the people from the valuable posts of their writers so it is a good extra income source. If we need to talk about some interesting facts of InfoBarrel then I have some facts of its past like Its beta version was launched in July 31st,2008 and the most interesting fact is that it became top 2500 most visited website in USA with massive traffic of 2,000,000 monthly in February 2012 and till February 2012 it has 88,000 registered members and over 90,000 published articles. We can consider Ryan McKenzie(Co-founder and Marketing Director) and Kevin Hinton(Co-founder and software Engineer) behind the success of InfoBarrel. 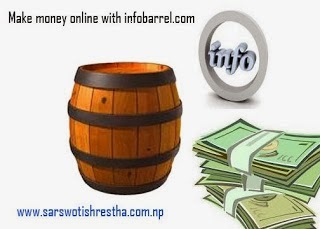 The working mechanism of InfoBarrel is simple but effective one and we find most of the revenue sharing websites have adopted this mechanism. The mechanism is that the people like you sign up in the InfoBarrel and have individual account then those people create some contents now here the contents can be of any sorts and of any formats like it can be short video clips, it can be text, picture galleries, etc. So, you have here heap of information. Now in these sorts of contents of the writers the InfoBarrel publishes ads under Google Adsense program or Chitika or Amazon ads. The revenue generated from these ads are shared with the writers at the ratio of 75%-90% to writers and 25%-10% for the InfoBarrel. It is not bad deal so we can find many people interested on it. InfoBarrel is not the website which accepts the plagiarized works so it does not want the same repeated contents. You get more bucks only if you generate something new in the web which has never been published so stop joining InfoBarrel if you don’t have creativity. You can generate a nice passive income only if you have unique contents and more visitors so most is the unique content. The writer are paid through their PayPal account under the IB Ads System. The writer can also share their works with the other people and also use the referral programs of the InfoBarrel. You can use InfoBarrel as a good source of passive income but you need to have some creativity in writing such that you can have some satisfying bucks in your hand. You give a try and continue if you like and keep in mind determination is the most in online earning.